14.2% alc., pH 3.62, $13, released March, 2009. From a family owned winery in Clarksburg, CA producing multiple varietals from its Delta vineyards, but having a good track record with value priced Pinot Noir as well. Aged 12 months in French and American oak. · A pretty solid wine for the fare featuring a rich core of black cherry and black raspberry fruit with underpinnings of exotic spices, dark chocolate, and smoke. The tannins are restrained and the finish is pleasingly fruity albeit a touch hot. Widely distributed. 13.9% alc., $17. Aged 9 months in French oak. · Moderately deep garnet color. Red fruits including strawberries and raspberries are featured in the aromas and flavors in a lighter-weighted style with a touch of savory herbs in the background. An easy drinker with gossamer tannins and a soft mouth feel. 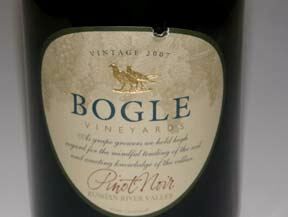 A consistently reliable producer of value-priced Pinot Noir. 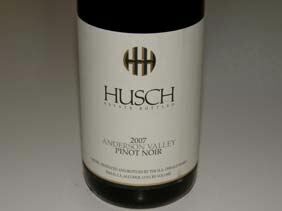 Available on the website at www.huschvineyards.com and through fine retail wine stores. 14.5% alc., pH 3.45, $24, screw cap. Dierberg Winery produces three tiers of Pinot Noir from the Santa Maria Valley Dierberg Vineyard. The Three Saints bottling is meant for early approachability and near-term enjoyment. The name comes from the 3 Saints - Maria, Rita and Ynez - representing three dynamic wine grape producing areas of Santa Barbara County. Grapes are de-stemmed but not crushed. Aged in 12% new French oak for 17 months, lightly fined and bottled without filtration. 100% Pinot Noir. · Very dark violet color. Fabulous nose with considerable interest. Aromas of plum sauce, black raspberry and blackberry, cardamon spice and white pepper. Darkly fruited with a touch of oak, earth, beef, tar and Moroccan spice on the palate. Discreetly rich with soft, fine tannins and a fruit-perfumed finish. Very Caliesque and thoroughly enjoyable now. 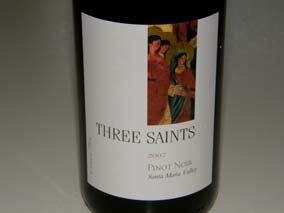 The wine has good retail distribution and is available online at www.threesaintsvineyard.com. 13.5% alc., 11,000 cases, $29. A popular restaurant wine. This is the winery’s value-play bottling sourced primarily from the Black Family Estate in the Dundee Hills AVA and Doe Ridge Estate in the Yamhill-Carlton AVA. Aged 10 months in French oak. The winemaker is Laurent Montalieu. · Not nearly as charming as the 2006 bottling. Silky and light in weight, the earthy fruit seems dilute and is dominated by oak throughout. I have been impressed with the wines from this producer and this may represent a bad bottle. 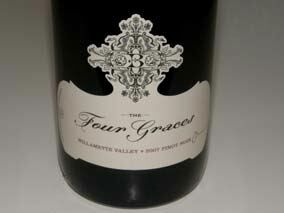 This wine is widely distributed and sold on the website at www.thefourgraces.com. 14.5% alc., $30. · Subdued but pleasant scents of black cherries and oak. The oak influence carries through on the palate. Decent cherry and berry tastes backed by savory herbs with a finish that is short and dry. Not up to the quality of the 2006 vintage bottling of this wine. 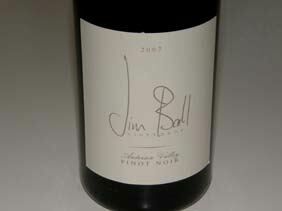 The wines are sold through a mailing list at www.jimballvineyards.com with some retail distribution. 14.8% alc., pH 3.60, 1,125 cases, $44. Sourced primarily from vineyards near the banks of the Russian River. Both inoculated and indigenous yeast ferments. · Hi-tone nose of flamboyant black cherry fruit with a touch of toasted bread and barnyard. Fat in the mouth with flavors of black cherries and red plums and an appealing earthiness. A good grip of acidity balances the full-bodied fruit nicely. Smoothly textured with plenty of length on the fruit-laden finish. Definitely worth a look. Sold primarily through a mailing list at www.muellerwine.com. 14.5% alc., $65. · Muted but pleasant aromas of cherries, grapes and a whiff of smoke. Luscious and discreetly rich cherry-berry compote on the palate. The fruit is crisp and juicy and accented with baking space. The wine gets better and better over time in the glass. Beautifully composed and well worth seeking out. 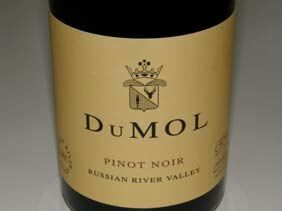 DuMol wines are sold through a tightly allocated mailing list at www.dumol.com. 14.8% alc., pH 3.75, 235 cases, $42. Inaugural Pinot Noir from this newer producer. The Derbyshire Vineyard is just 1.25 miles inland from the Pacific Ocean bordering the Hearst Ranch. 62 acres were planted in 2002 to Pinot Noir clones 115, 667 and 777 and Pinot Gris. Grapes are also sold to Tantara, Wind Gap Wines and Wild Horse. 50% whole cluster. Aged 18-20 months in 50% new French oak. Unfined and unfiltered. The winemaker is Tiffinee Vierra. · Deep reddish-purple color. Alluring scents of dark cherries, Moroccan spice and sage. Discreetly concentrated core of cherry and red plum fruit with overtones of herbs and vanilla and a tangy finish that lingers with a grapefruit peel note. The tannins are supple permitting easy drink-ability. Sold on the winery’s website at www.derbywineestates.com.